I just came across this video of a dognapping kitty and submit it for consideration in one of your Caturday felid trifectas. It is heartwarming: a cat was observed carrying tiny puppies by the scruff of their necks, one and then another, transporting them somewhere. At first, people couldn’t determine what was going on: what was she doing and why? What happened to the puppies? Then the mystery began to unravel. She had recently given birth and lost all her kittens; a neighbor’s cocker spaniel had also recently given birth, but spurned the puppies. The mother cat sensed what was happening (I’m always amazed by such things) and took the puppies, one by one, to her place, and she let them nurse. Are they going to hiss and spit when they grow up? Then she also accepted two kittens, so had a passel. The last shots of her show just how contented she is. What puzzles me is how cat milk can nourish d*gs! Teddy and his buddies in the dryer. Look at that mustachioed fellow in the back—a Groucho cat! This entry was written by whyevolutionistrue and posted on August 25, 2018 at 9:30 am and filed under Caturday felids. Bookmark the permalink. Follow any comments here with the RSS feed for this post. Both comments and trackbacks are currently closed. My brother accidentally killed his cat by turning on the dryer with the cat inside. He cites it as one of the worst experiences of his life. I wouldn’t let my cat go in the dryer. I’m real sorry to hear that Mark. People kill their children leaving them in locked cars too. So do they stop putting them in cars? Now, I do not have kids, but have had cats all my life nearly. Have not lost one in the dryer yet. But then, I would look in the dryer before ever turning it on and would never shut the door with the cat inside. This is a really stupid argument to be having. But I suppose some people just want to have it anyway. I didn’t think it was an argument…just opining. You are correct and I should just move on. There was something about the original opinion from Ruthann that just got me. It was something like – I question the wisdom of allowing cats in the dryer. Maybe a harmless statement but it sounds kind of like – If you would allow a cat in the dryer then there must be something wrong with you. ??? Apparently a comment’s been deleted? Agreed. My mother dried our cat once and never got over it (neither did the cat, who did not survive). Aw! Please stop with these gruesome stories. They were so upsetting I had to go check on my cats. I question the wisdom of allowing cats in the dryer because one of my veterinarians, who was extremely careful with their cats, was once unaware that a cat was in the dryer. The dryer was turned on and ran for a while, and when it was opened, the cat was near death and had to be put to sleep. I can’t imagine the torment that cat went through. This happens more than people think, so my cats are never allowed near the dryer. I have often wondered why appliances like micros and washers has no “live animal” trip detection. It does not happen often, but if it can kill children and animals… We can do better. Yes, that would scare me too. So far, our cats have never shown an interest in our dryer. They dislike mechanical noises too much to bother with it. Of course, they don’t know the pleasures of luxuriating in warm clothes but I am not going to let them find out. That’s a good one. Because you heard of something stupid, you questions the wisdom. I wrote my comment above before reading this. My brother killed his cat this way. Keep dryers closed! The oriental shorthair is a breed related to the Siamese cat. This brings up a question I have which is why aren’t Siamese cats more common these days? When I was young they were a very popular breed, but I have not seen one in 40 years. Somehow I sympathize with Teddy “Honk” Shorthair while waiting for the web tumbler to open up to a warm Caturday article. I must confess being mystified by the befriend a cat advice/video. As I remember it we neighborhood children learned all of that early on, including the limp hand finger curl. Maybe it rubbed off from adult cat owners? Re. 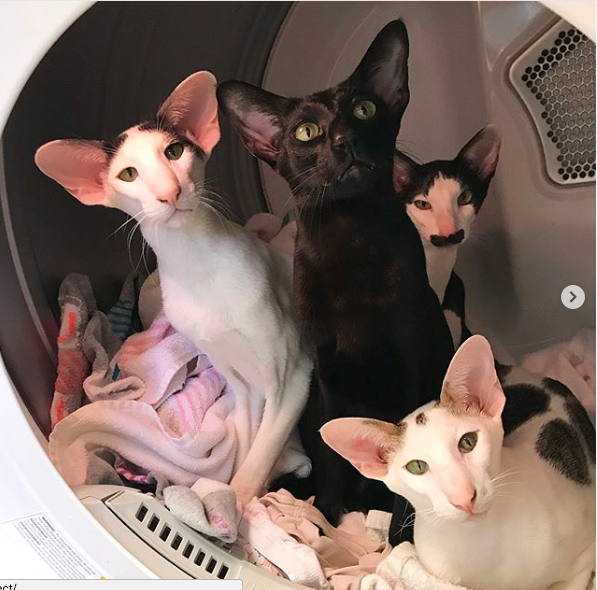 the photo of the cats in the dryer at the bottom: I think the one at the back looks more like Ron Mael from Sparks than Hitler. “What puzzles me is how cat milk can nourish d*gs! Plenty of species can be nourished by the milk of other species. We drink cow milk. And, I donate milk to our zoo and our wild animal park for their orphans. The zoo has raised camels, okapi, other small ungulates, and even a giraffe on our goat milk. I would be more concerned about the queen’s ability to produce enough quantity than about the nutritional quality of the milk. But, I guess if the puppies are a small breed, it’s feasible. Goat’s milk is the best! Also my favorite milk for yogurt. Goat milk really is the “universal milk”. You can raise many species on it without problems. I had a neighbor several years ago who lost a mare in mid-foaling. Fortunately, the vet was there, and he C-sectioned the foal out of the mare AFTER she died, and got him going. I always keep colostrum in the freezer, and Sue came over and got some right away. The vet tube-fed the foal for the first two feedings, and then Sue got him on a bottle. She switched to milk after two days, and raised him to weaning. He never had mare’s milk, ever. He went on to many wins in the show ring, too. Must have been the goat milk. The original Caesarian section (in Roman times, and earlier the Regal section) was performed after the mother died in child-birth. I think ‘Caesarian’ because the baby belonged to the emperor. The first documented ‘Caesarian’ where the mother survived was carried out in 1500, by a German pig butcher, who had the brilliant idea of stitching the womb. Must have been a dreadful affair without anaesthetics. This is called “perimortem CS”. I’m just going to post to say that I knew Jackson before he was famous. He was a cool guy then so I’m not surprised he’s doing well with his cat whisperer gig. If you want a cat’s attention, might I suggest opening a book, a laptop, or as is happening now, using a smartphone. The whole time I was reading this post, my furry friend was meowing and clawing/patting my hand/arm/shirt until I gave some fusses. Similarly, try sitting down on a toilet to do your business, at least this is what my cat does…basically, try giving attention to something else and like a jealous god, a cat will suddenly demand your attention. Those cats have the weirdest ears. Do you suppose if they flapped them extremely fast in a very strong wind… nah. But I can’t help fantasising about that.